Anyway, buying grout is pretty straight forward. Know the size of your grout lines. This would be easy if you used spacers. I had 1/16″ spacers but stopped using them after about an hour. Choose your color. The darker the better in my opinion because it’s just going to get dirty. That being said, I hate dark grout and white tiles. I know it’s a look. I just do not like it. So my advice is if you are deciding between a few different colors, go with the darkest option. 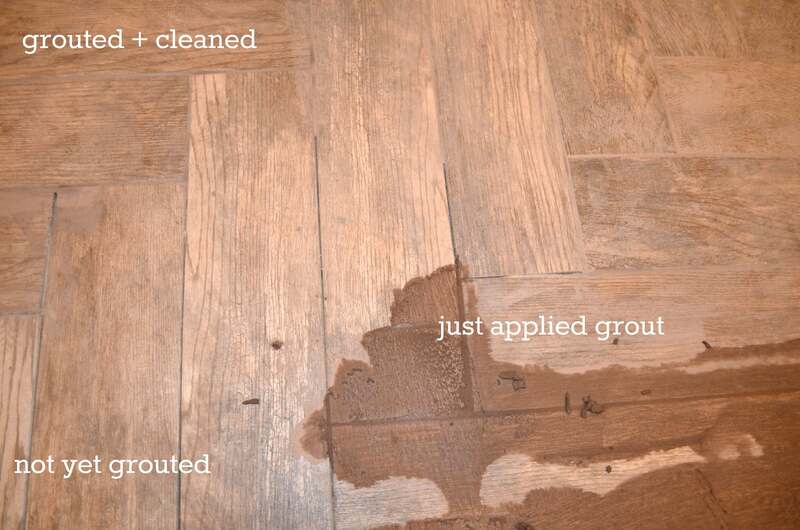 Sanded grout is for wider grout lines, anything greater than 1/8″. The sand helps bind the grout together, making it stronger and solid. 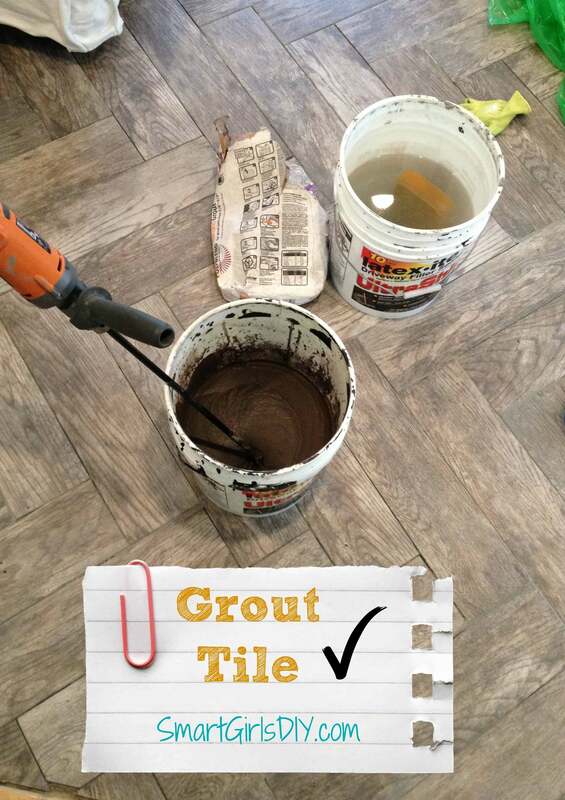 For grout lines less than 1/8″ the grout doesn’t need to be as strong, therefore the sand isn’t required, hence the unsanded grout. 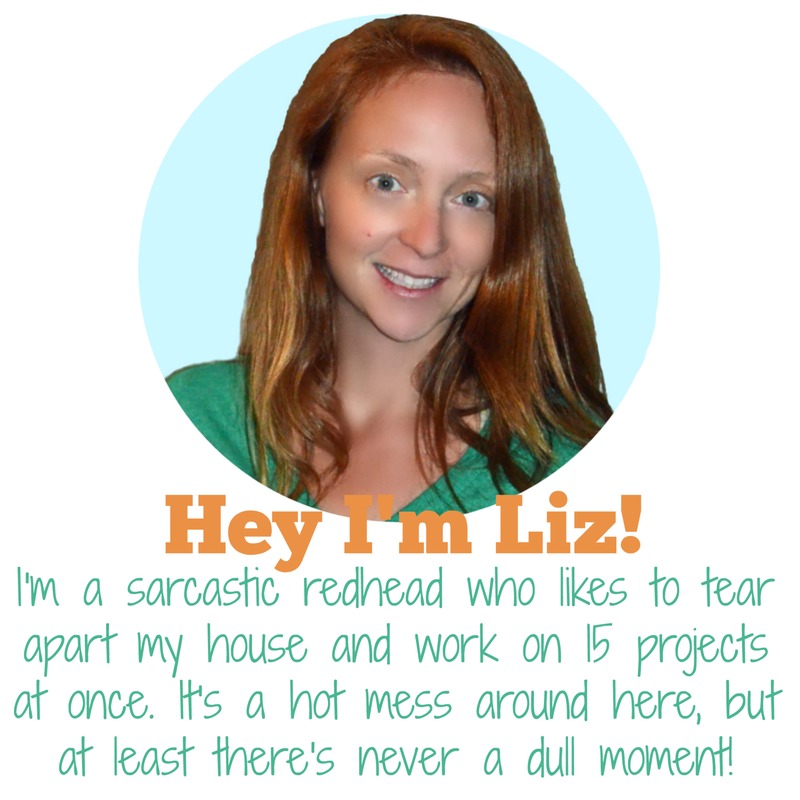 But… using sanded grout even when it’s not “needed” can still be okay. 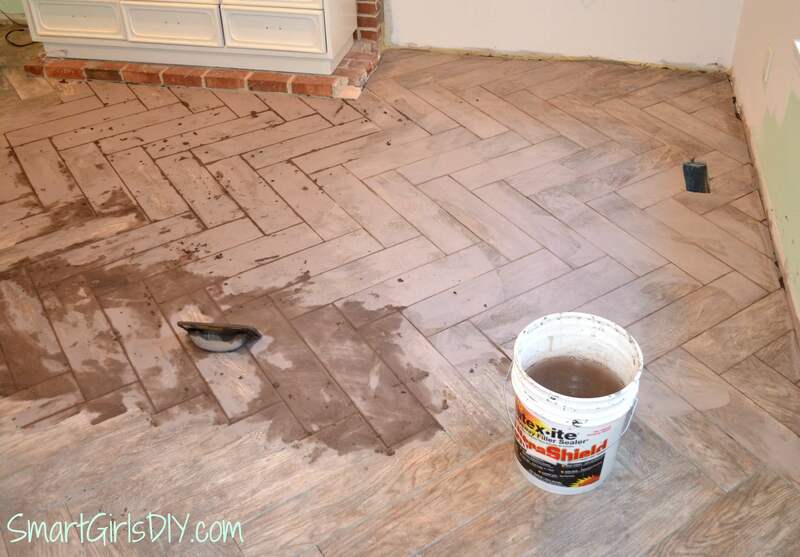 It worked well with my porcelain tile, but I wouldn’t want to use it on marble and finer materials. Always follow the directions that come with your tile, and use the suggested grout. The other issue with using sanded grout on thin grout lines is that it can be hard to push the thicker grout into the small spaces. I didn’t have a problem with this. I bought my grout at Home Depot. I used Polyblend in New Taupe and I only needed two bags. That color swatch is ridiculous by the way because it looks nothing like that. But New Taupe only came in sanded (just my luck! ), so I ended up using sanded grout on my tiny grout lines. I mixed up one bag with my trusty new drill and mixing attachment I bought for the self-leveler (post HERE) and was ready to go. Oh and I got a kick out of the fact that I had a ton of 5-gallon buckets left over from sealing the driveway. Asphalt is so much easier to rinse out than concrete!!! The grout went in the lines just fine. Grout floats are cool. It made pushing the grout into the lines a piece of cake. The real bummer with grouting is cleaning the grout off the tile. There’s just no way to get the grout in the lines without getting some on the tile. Oh how I wish there were. That section at the top has already been “cleaned.” Crazy right!? I wiped the tiles with a wet sponge and rung it out constantly in clean water and I felt like I was doing nothing. It was such a pain. The water had to be changed every few tiles and they still looked all cloudy when I was finished. So I gave up! I grouted the whole dang floor and let the grout dry on the tile. Gasp! I know. That’s like the golden rule of grouting… don’t let it dry on the tiles. Whatever. I live on the edge. I found it much easier to rub/scrape the grout off with a dry rag. No more rinsing water buckets. I watched TV and worked that night until I couldn’t stand it anymore. Then I finished up the next day. I think I had an extra difficult time getting the grout off because the tiles I used are textured. They have a real wood grain quality to them. The grout liked to get stuck in the grooves and a wet sponge wasn’t doing any good. It was definitely a labor of love. I’d scrape – scrape – scrape, then vacuum up the dust. There were a few spots I missed initially, so I mixed up a small bowl of grout just estimating the water content. 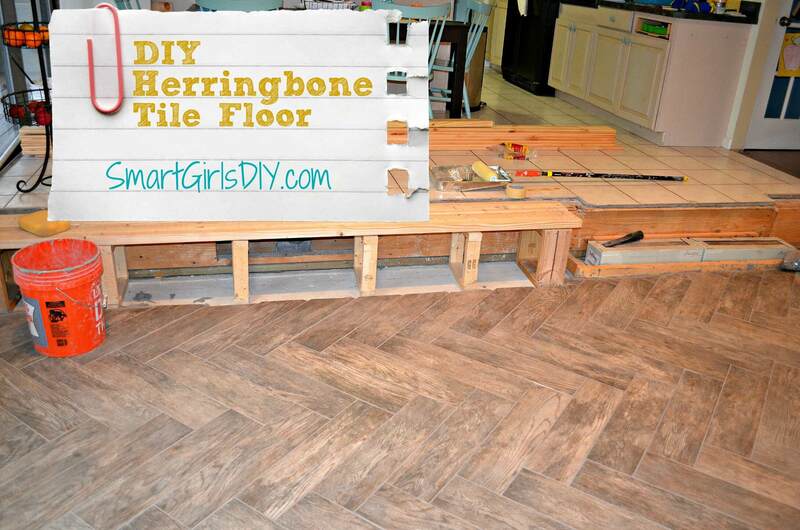 And eventually it started to look awesome… And there you have it… My DIY herringbone tile floor. 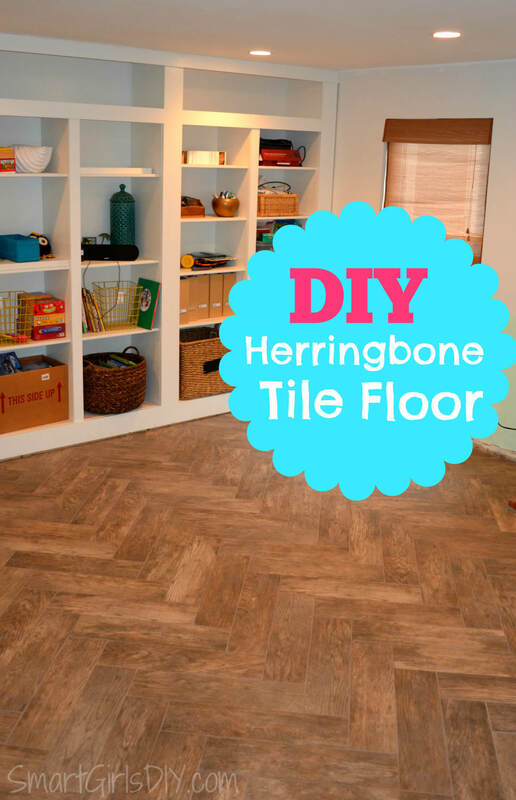 Make sure to check out how I installed the tile HERE. Just if you’re wondering — I didn’t seal the grout. It seems to be doing just fine without it, but I’ll keep you posted. Oh, man! 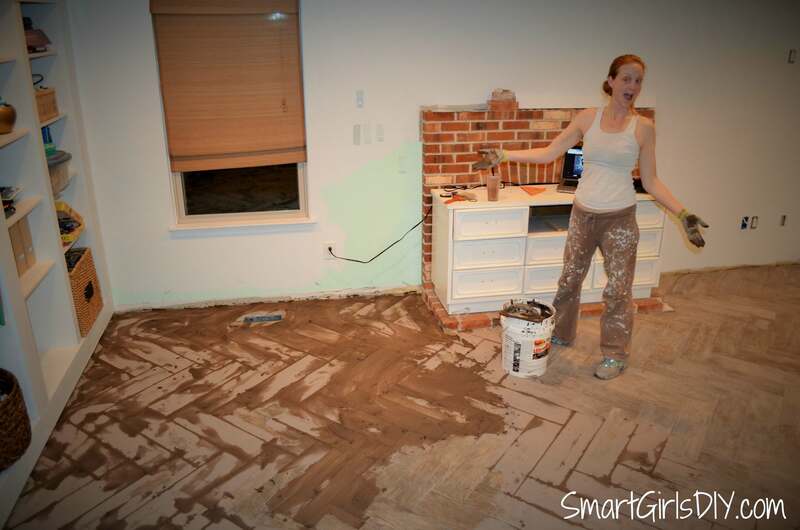 I hear ya about changing the water A LOT when grouting, but doing what you did…wow! lol Yes, you do live on the edge. 😉 Those floors look great and I am always amazed how grout can pull everything together. Are you nearing completion for that room? Nearing-ish. 😉 I still have curtains, the fireplace and a dresser update, but the bulk of it is done. And what’s holding me back with the fireplace is that I can’t figure out how I want it to look. But we’ve been using it for months now. The TV is hung and we actually just went back to cable. 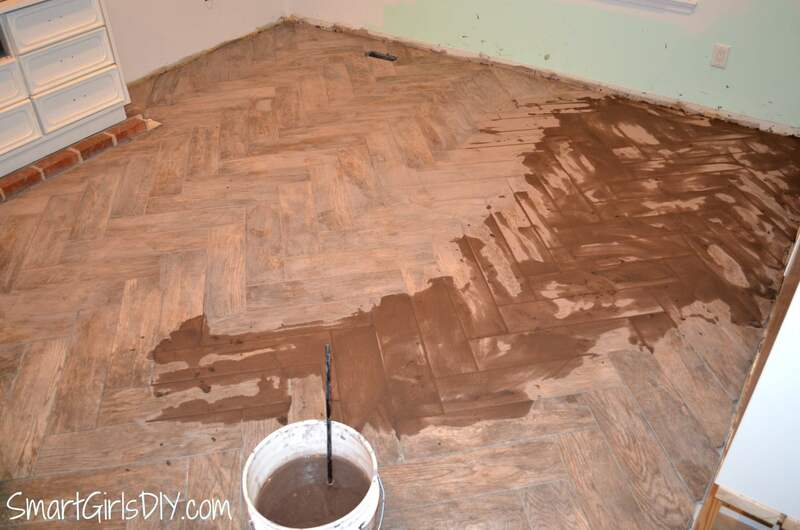 Are you still happy with your floor? Thanks so much for all your helpful ideas! 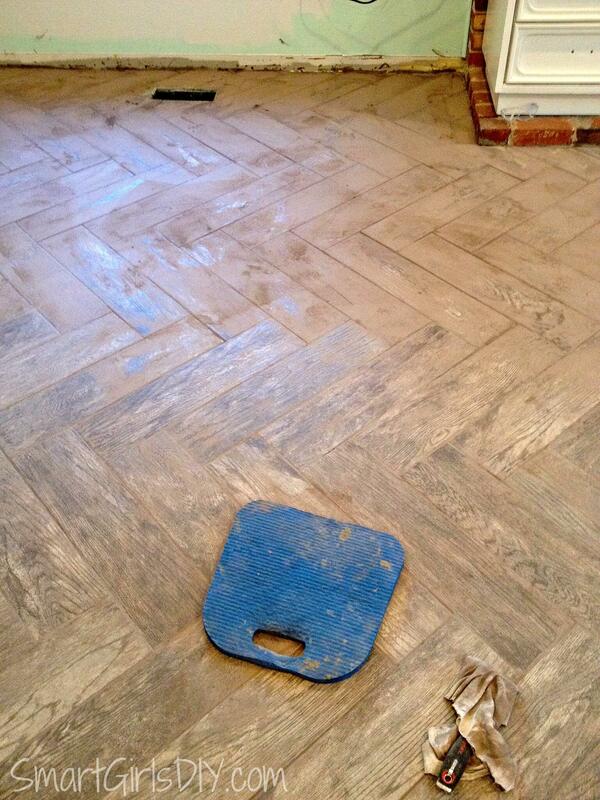 We are getting ready to do a herringbone pattern in our family room due to it getting flooded. Out went the carpet. Our tile is similar to yours. Same size. Different pattern. Question: You said you quit using the 1/16″ spacers. Did you just estimate the space, or did you just put the tiles against each other? The lady where we bought the tile said you didn’t have to have a grout line with these tile, but I thought a grant line was always needed. Thanks for help. She’s right. There will be a small grout line even if you put the tiles right up against each other because the edges of the tile are lower, meaning the grout will sit on top of the low tile edge. 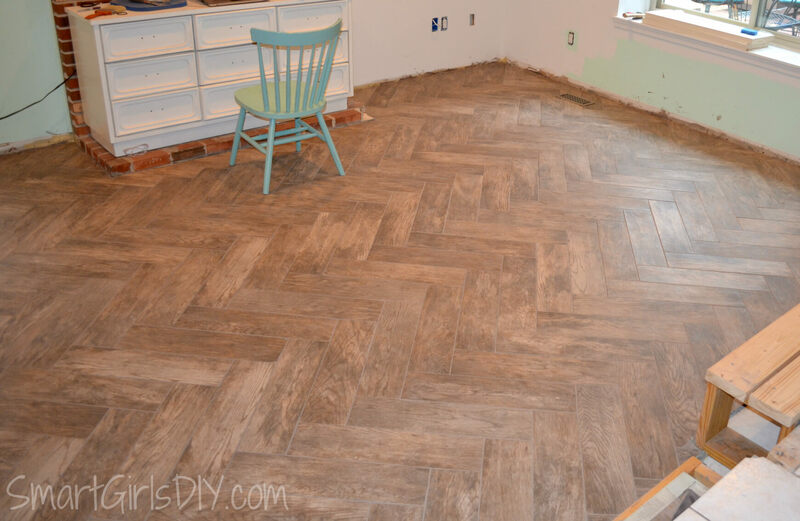 Grout is used as a buffer, a forgiveness area for less than perfectly aligned tile. 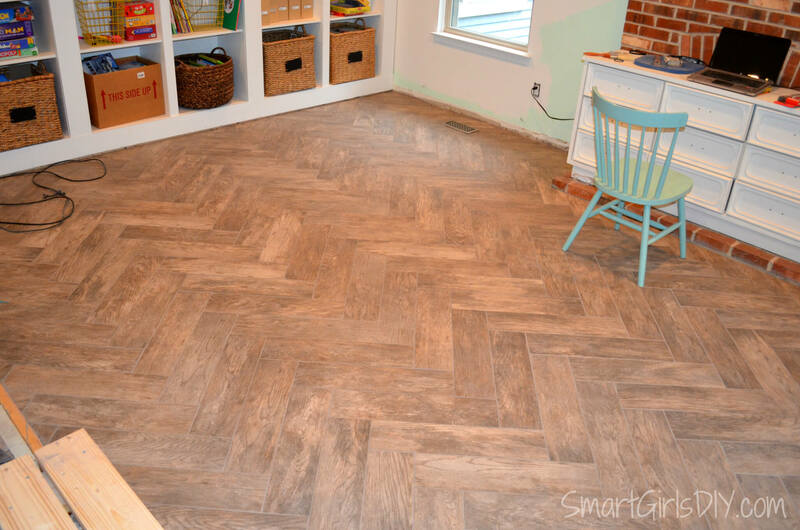 It is more difficult to lay tile without space between them because there is no margin for error. But you don’t need it. Mine looks grouted, but that being said, there have been several people who insist it’s wood and not tile at all… until I tell them to feel it. Good luck! 1. 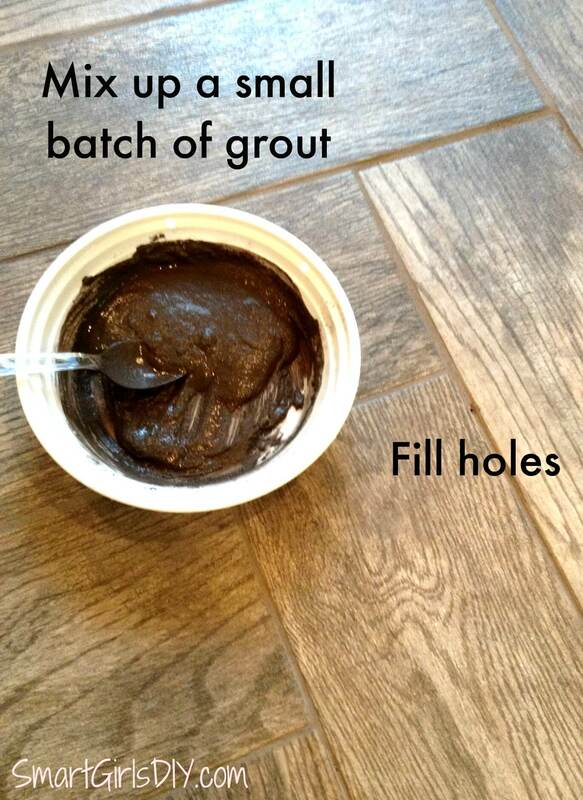 Apply grout with float, pressing into joints. Turn float almost perpendicular to floor to scrape excess grout to next area. 2. About 30 minutes after you started putting the grout in, go back to where you started and start working the joints with a ringed out sponge to smooth them. 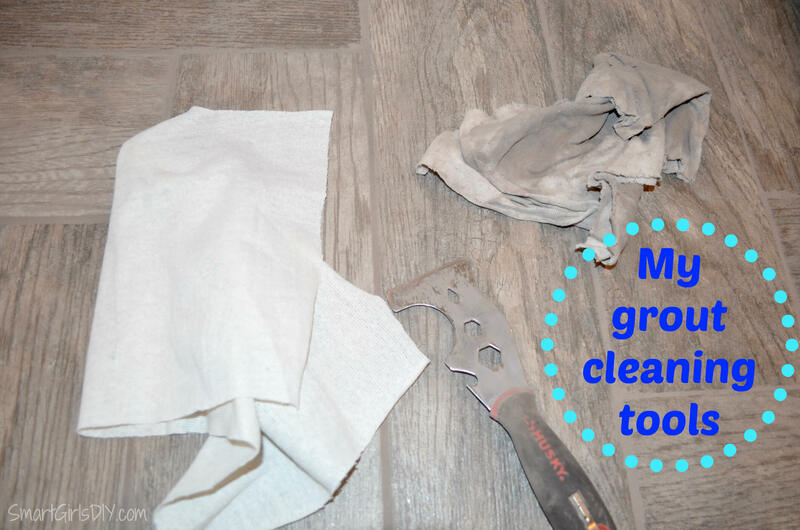 Don’t worry about cleaning up all the grout from the tile at this point. Just focus on the joints and any globs of grout on top of the tiles. 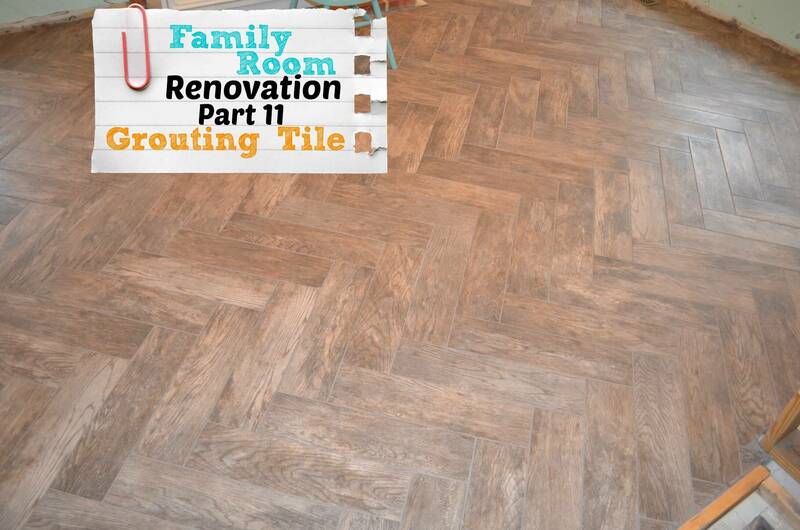 **Note that you don’t want to wait 30 minutes after you finish putting the grout in…by that time your grout may have started to set up which will make the job harder. 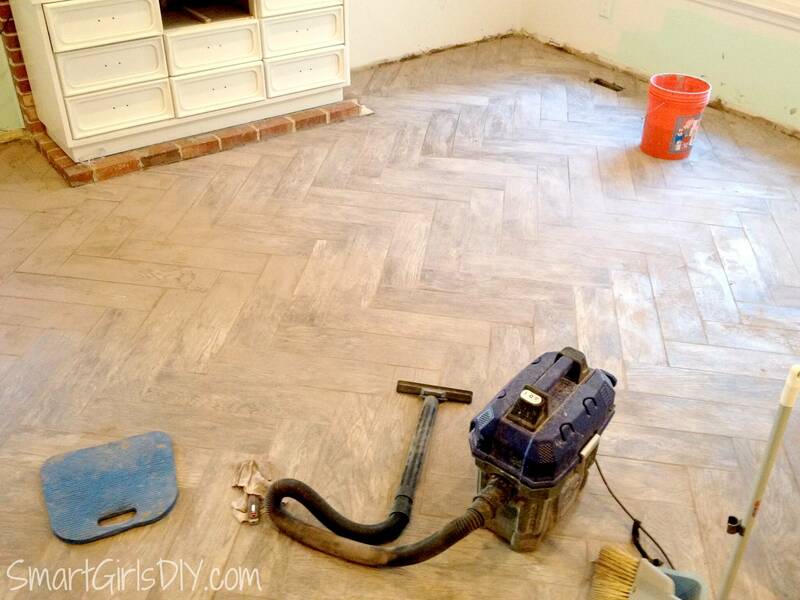 As soon as you’re done putting grout in, start this step. 3. Immediately after you work the joints, go back to the beginning again. The tiles should be hazed over. Take your ringed out sponge and clean water bucket and start wiping the tile in single strokes in one direction using moderate pressure, cleaning the sponge after each wipe. I usually use two sponges, start in a corner and wipe about a 6′ line, turn the sponge over and wipe the next line and repeat with the next sponge until you finish the area. After that, when it dries there should be no grout on the face of your tiles and either no haze or very minimal streaking that can be cleaned up with a dry cloth or a mop.